"The Thing" Repository on Github. This project was created on 02/01/2019 and last updated a day ago. Two dev boards into one: a STM32 based Arduino ("Maple Mini" compatible) and a Cyclone II FPGA dev. board to start playing with VHDL/Verilog. It is also "Multicomp" compatible ("Multicomp" is a modular VHDL design to "run" some famous retro 8 bit CPUs made by Grant Searle) giving the option to "run" easily a VHDL SOC with a Z80/6809/6502 CPU and I/O, including HD (on SD) and a color VDU. The Thing is the the "natural" evolution of the CPLD Fun Board. The idea was to make a FPGA board using cheap and easy to find components, with a STM32 Arduino used as "stimulus generator" or "companion" processor for the FPGA, and with a 512KB SRAM and common I/O as GPIOs, VGA and a PS/2 keyboard to "run" HDL SOCs. More, it has the option to "run" easily Multicomp VHDL SOCs having the needed HW. Multicomp is a modular VHDL design to "run" some famous retro 8 bit CPUs made by Grant Searle and described here. The STM32F103C8T6 MCU is used as "stimulus generator" or "companion" MCU for the FPGA, and is easily programmed using the friendly Arduino IDE through the USB connector. There is also a dedicated GPIO connector (GPIO1). To configure the FPGA (EP2C5T144C8N) it is used the Quartus II IDE (the v13sp1 free edition is the last one supporting the Cyclone II FPGA) and a cheap "USB Blaster" dongle through the JTAG or AS connector. To permanently store the FPGA configuration into the eeprom you can use the AS connector or also the JTAG connector with the SFL IP core as well explained in this Intel video. Wanting to test some multi-user MP/M configurations, I&apos;ve decided to make a VT100-like "stand-alone" terminal starting from the uTerm, the VT100 terminal for the Z80-MBC2 board. I&apos;ve decided to use THP parts (of course the STM32 is SMD only...) so it may be easier to build for others "retro" stuff too. This is a ready to use example of a custom "multi-functional" controller for a 4 digits 7-segments led display (single segment "graphic" drive mode with digits multiplexing), plus 3 status leds, plus 3 push buttons, using a bidirectional data bus (DATA_0-7) and a register selection bus (SEL_0-2). The command signals are an active low write signal (WR_EN) and an active low read signal (RD_EN). The behavior is very similar to a SRAM device. To make things easier, in this example it is used the schematic editor and the 7400 devices family library, but note that this is not the best way to use a FPGA (the "right way" is to use VHDL/Verilog languages...). The input clock for the multiplex comes from the 50MHz oscillator, and is divided by two 1:256 dividers (74393). The internal digit registers are 8 bits wide, because each single segment can be controlled, and there is a 3 bits register for the three leds LED1-3 (LED4 is a status led and isn&apos;t user "addressable"). The complete Quartus II project (H170119_Multifun.zip) can be downloaded from the repository. Upload the configuration into the FPGA using the JTAG connector, or with the AS connector to store it in the eeprom. The sketch for the MCU side (S030319_MultiFun.ino) can be downloaded from the repository. Note that the USR1-3 and BUT buttons are managed directly by the MCU (see the A191117 schematic). At the end of the video it is possible see the effect of the DEV_CLRn button (clears all the FFs inside the FPGA) and the DEV_OE switch (forces all the I/O pins of the FPGA in HiZ). The effect here is "visually" the same, but the inner behavior is different. Here are shown the connection and disconnection procedure for the USB Blaster programming device. The board in the videos is different but the procedures will apply to the JTAG and AS connectors of "The Thing" too. Power the target. This means connect the board USB connector to an other USB port on the Workstation. Remember that the USB Blaster can&apos;t power the target. The power comes from the USB connector. Disconnect the Usb-Blaster programmer from the Workstation USB. As already said in the previous Logs, the DEV_OE switch forces all the FPGA I/O pins into a HiZ state. When the DEV_OE switch is in the HiZ position, the DEV_OE led is on. This switch comes handy in various way. A possible application is the case in which you want only use the STM32 "side" of "The Thing", and use the TEST1-2 connectors as GPIOs pins of the MCU as a "Maple Mini" clone. In this way you can simply "freeze" the FPGA holding the configuration inside. But there is a situation in which this switch comes very very handy. Imagine that you are testing a custom interface loaded into the FPGA, and simulating this interface in a "real" situation using the STM32 as "stimulus" generator. Imagine that you have some output pins (signals from the FPGAto the STM32) and some input pins (signals from the STM32 to the FPGA). Well, if you update the FPGA configuration at first, the new configuration will change an input as output, so this can generate a short circuit between the FPGA and the STM32 because there would be two output connected together. The only way to break this "deadlock" is to use the DEV_OE switch to force all the FPGA I/O pins to an HiZ state and then upload the new FPGA configuration and the new sketch for the STM32 with the input/output accordingly updated. Only when both FPGA and the STM32 are updated you can safely revert the FPGA from HiZ with the DEV_OE switch again. In the following I&apos;ll use Quartus II version 13.0SP1 (Service Pack 1) because it is last version supporting the Cyclone II FPGA series. After installing Quartus II IDE (you can get it from here after a registration) it is necessary change some default setting on your Quartus II project to better suit "The Thing" (the default configuration is potentially dangerous for the board). 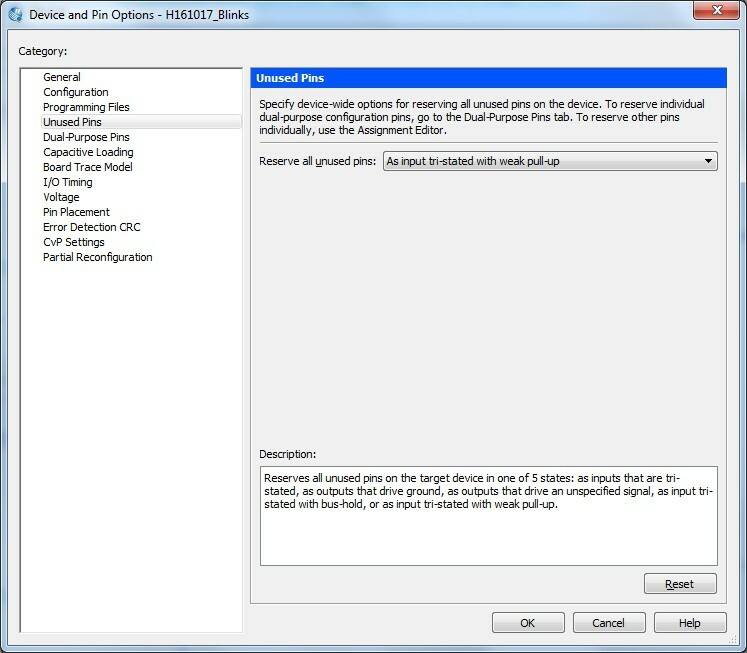 This setting must be used for every new Quartus II project. 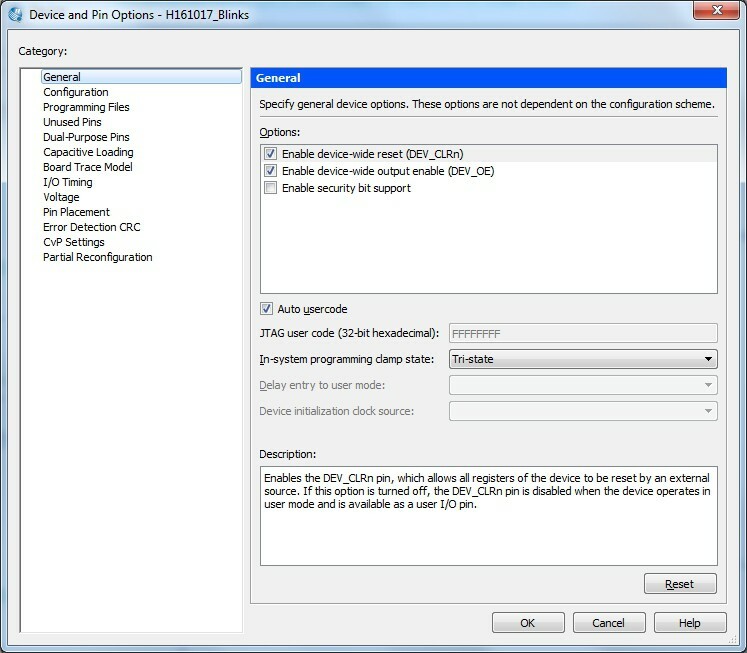 set the "Enable device-wide reset (DEV_CLRn)" and "Enable device-wide output enable (DEV_OE)" check boxes. In this way you enable the "DEV_CLRn" key and the "DEV_OE" switch in the "The Thing" board. These are two important functions: the first will reset all the FFs inside all the LEs (Logic Elements) with the "DEV_CLRn" key, and the second will enable the possibility to set all the FPGA pins to HiZ using the "DEV_OE" switch. Now you will set up the state of all the unused FPGA pins. "Unused" here means not referenced explicitly in the "programming" phase. Check that the Active Serial mode is selected. and in the "Reserve all unused pins" field set "As input tri-stated weak pull-up". This is the best (and safer) option for the "The Thing" board. and select "Use as regular I/O" for the nCEO pin. I&apos;m very interested in this board but also in the process of building the "CPLD Fun Board". I am considering having to try KiCAD (rather than my usual layout software) to modify the artwork if necessary otherwise I&apos;ll have to start from scratch/schematic. Greatly appreciate the amount of detailed info on these boards. Nice to have something with a good chance of working. Using a 2-layer PCB this is very important. To assemble the board I use an optical stereoscopic microscope by hand. With that it is easy, using solder paste and an hot hair soldering station (I mean... enough easy...). No pick-and-place machine is needed. Here you can see the "making"...: https://www.elettroamici.org/en/commmunity/topic/the-thing-la-cosa/ (automatic English translation). You are about to report the project ""The Thing": FPGA + STM32", please tell us the reason.